Thank you to all the voters who supported the Library’s 1.9-mill operating levy on May 8. We are grateful for the community’s vote of approval. We appreciate our community’s continued support for Shaker Library and the confidence it has placed in our Board of Trustees and staff. We have served the community for 81 years and we plan to serve for decades to come. We won’t receive the additional levy revenue until 2019, so we will begin making improvements then. We have worked so hard to hide our buildings’ flaws so many folks were not aware of the depth of the problem. We have conceptual ideas for renovating our buildings to provide easier access and to add more collaborative spaces for community use. As we move forward with more concrete plans we will continue to update the community and seek input. We welcome your comments and suggestions. Please share them here. Thanks are in order to City Councilwoman and City Tree Advisory Board member Nancy Moore, who helped us plan another successful April Poster and PoeTREE Contest for Arbor Day and to Gali’s Florist and Garden Center which provided beautiful flowering crabapple trees to the young winners. It is always an uplifting afternoon. Thanks also to Mayor David Weiss who presented the children their trees and certificates. 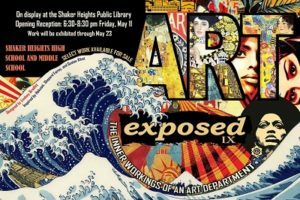 Art Exposed IX will be on display through May 23 on the Main Library second floor. Be sure to take the time to see the art created by Shaker Heights High School and Shaker Middle School students. It is an impressive exhibit of students’ talents and teachers’ dedication. If you plan to travel internationally this summer, make the Library the first stop on your itinerary. We now offer Passport Processing and Photo Services by appointment. The end of the school year is fast approaching and our staff has planned summer reading fun for children, teens and adults. This year’s summer reading theme is Shaker Reads: Art Builds Community. We encourage everyone to join in a summer that celebrates art, music, books, and reading and invite you and your family to our Sounds of Summer Kickoff Event June 7 from 6-8 pm at Main Library. Set your summer reading goals and join us for story and crafts and book and author events throughout the summer. Shaker Library is pleased to partner with ideastream when it presents The Great American Read, an eight-part television and online series designed to spark a national conversation about reading and the books that have inspired, moved, and shaped us. Whether it’s rediscovering an old favorite or engaging with a new title, ideastream encourages you to read some, many, or all of the 100 best-loved American novels (as chosen in a national survey) as PBS celebrates the joy of reading and the books we love! Be sure to put one of two of these titles on your summer reading list. Libraries are essential to communities, and no other place comes close. Every week within our walls, children attend story times, immigrants come to ESL classes, job seekers update their skills, and many of us discover books that change our lives. Our library staff are champions of our communities who make sure the library remains a safe and welcoming space for all who enter. Thank you again for placing your trust in us.